Limited exposure winter glove. Excellent for arena riding or winter exercising. Excellent grip in dry, rainy or snowy conditions. 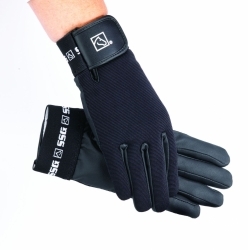 Thinsulate lining on back of hand and thumb for warmth without bulk. Wide self-fastening wrist badn for warmth and support. Machine washable, air dry.